PEST: A batch of mosquitoes near Hwy. 27 and Major Mackenzie Dr. have tested positive for West Nile virus. It's the first batch to test positive in the region this year. No human cases have been found so far. VAUGHAN – West Nile virus has once again turned up in Vaughan, this time in a batch of mosquitoes near Hwy. 27 and Major Mackenzie Dr. These bloodsuckers are the first to test positive for the disease in York Region this year, the region’s health services department reports. Area catch basins and other pools of stagnant water on public property, such as roadside ditches, are receiving ongoing treatments of Methoprene, a slow-release larvicide delivered in pellet form. Treated catch basins are marked with a coloured dot. According to the region, the larvicide is provincially and federally approved and poses only a low risk to people, pets and the environment when applied correctly. Two mosquito pools tested positive for West Nile in York Region last year, the region says, and no human cases have been found so far in 2009. 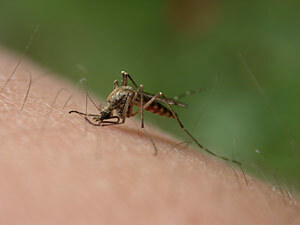 Symptoms of the disease usually develop between two and 15 days after being bitten by an infected mosquito and include fever, muscle weakness, stiff neck, confusion, a sudden sensitivity to light and severe headache. In a few rare cases, the region says, West Nile causes serious neurological illness, including encephalitis, or inflammation of the brain. According to the province’s Health Ministry, research shows one of every five people bitten by an infected mosquito develop any symptoms and only one in 150 will experience severe symptoms. For more information on the West Nile virus, call the York Region Health Connection at 1-800-361-5653.